The Place It is every chocoholic’s dream to walk into a space like The Dark Gallery, the brand-new café at Millenia Walk which specialises in chocolate desserts and drinks. The chocolate dessert cafe is located close to Patisserie G, taking the form of a casual and open space concept. 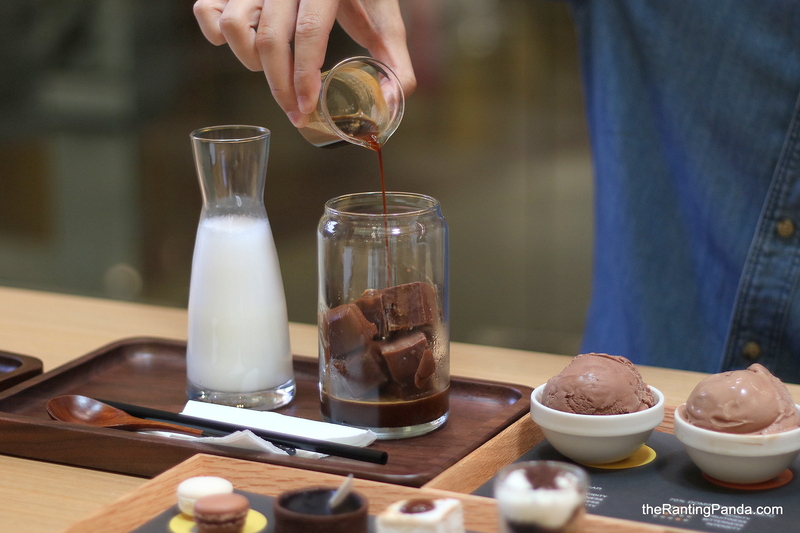 With outlets in Kuala Lumpur as well, I find it surprising that there are not many chocolate specialty cafes in Singapore apart from the awfully obvious Awfully Chocolate and what used to be everyone’s favourite chocolate hotspot Max Brenner. The Food As the name suggests, The Dark Gallery focuses on dark chocolates and in particular, single origin cocoa beans. I have heard of whisky tasting flights and it was the first time I tried a chocolate tasting flight. The Single Origin Chocolate Ice Cream Platter (S$12) is a good starting ground to savour three different single origin cocoa beans at one go – The 64% Madagascar, 70% Dominican Republic and the 72% Venezuela. My favourite of the lot is the 64% Madagascar, which is intense enough for me. Comparatively, the 70% Dominican Republic is more fruity while the 72% Venezuela is unsurprisingly more bitter. I also love the tasting notes on the platter which makes it much easier to reference each flavour to its taste profile. Other than ice cream, expect chocolate pastries no less as well. The Single Origin Chocolate Pastries Platter (S$12) is ideal for sharing, and if you are itching for desserts but do not want to over-indulge. The petite size platter consists of two 64% Madagascan chocolate macarons, a 66% Ecuador dark chocolate ganache, a homemade S’more of molten 70% Dominican Republic dark chocolate on a torched marshmallow and graham cracker, and a 72% Venezuelan dark chocolate mousse with caramelised bananas and brownie chunks. For plated desserts, we tried The Chocolate Rhapsody (S$18), which is a combination of The Dark Gallery‘s signature dark, milk and white chocolate ice cream, along with chocolate soil, mousse and meringue. I have outgrown white chocolate as I find it too sweet, but the chocolate flavours can’t go wrong here. It is rich, intense and didn’t come across as too sweet. Other desserts to expect include the Frozen S’more (S$7.50), which contains a 80% dark chocolate ice cream within,and the Assorted Artisanal Macarons (S$3 each). For drinks, the Signature Hot Chocolate (S$7) is a rich and indulgent option made from pure Valrhona dark chocolate. Alternatively, the Chocolate Cube Hazelnut Latte (S$9) comes with a set of frozen chocolate cubes, steamed milk and hazelnut espresso. My recommendation is to go easy on the milk as it dilutes the hazelnut flavour. Rants We are no exhibitionist animals, so the very open dining concept here screams attention. It is a great place to people watch, and well, be watched. Will I Return Again? The chocolate theme is strong, and I am generally impressed with the quality of the chocolate from the drinks to the desserts at The Dark Gallery. Many cafes lack character and a strong theme these days, and glad to say that The Dark Gallery has definitely emerged well from the dark side. And yes, we love their wooden plates – alot.